I am a resident of Netherhall Gardens in Hampstead in the Borough of Camden. 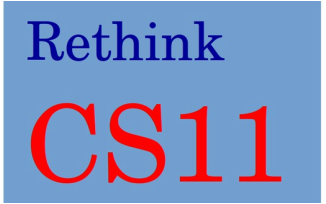 I have studied with interest your response on behalf of the London Borough of Camden to TfL’s consultation on CS11. You were absolutely correct to express your concern about “some aspects of the scheme, in particular the potential impact of additional traffic flows on residential borough roads” and correct to “propose that more work is done to address these issues”. I share your concerns about the Hampstead Heath area and your warning that “The area is currently recognised by officers as being extremely sensitive in terms of traffic congestion surrounding the Royal Free Hospital”. I am 100% with you when you say that “we cannot support the predicted traffic increases on this part of the network”. Your reservation could not have been better expressed when you said: “Residents as well as officers need to see the accurate reassignment information in order to fully understand how the project will affect them including the benefits it would yield in order for them to provide an informed opinion on the project”. I am one of those residents you refer to. I certainly have not seen the information requested in your letter, and understand that this applies equally to you and your officers. I therefore concur with you that councillors, officers and residents have not been able to provide an informed opinion on CS11. I share your concerns about Arkwright Road, given – as you rightly say – that “this area has been consistently highlighted as posing a risk for conflict by residents (including school children)”. Have these been addressed to your satisfaction? Your observations about Fairfax Road and the Belsize Roundabout are highly pertinent, especially as you point out that Camden’s own Quietway could be compromised. Indeed, I believe they do not go far enough as this area is shown to be one of the worst affected when you study the detail of the traffic displaced by CS11. Your points about Avenue Road are well made. Have you received adequate clarity and mitigation as you request? You correctly identify the conflict between Camden’s own cycle grid and CS11 at Parkway, Pratt Street and Delancey Street. Have you concluded between yourselves and TfL which scheme should take priority? Your letter identifies certain banned turns which are likely to exacerbate already unacceptable pollution and congestion issues in Hampstead and West and South Hampstead. Here, I do not believe you go far enough – surely it is not just a case of quantified benefit but one of carefully analysing the traffic displacement and evaluating whether this is acceptable. I for one do not believe it is. I believe it is your duty to share with the residents and businesses of Camden every response you receive from TfL to every one of your concerns and, if necessary, consult with them before determining if the concern has been satisfactorily addressed. You refer to HS2 and its construction programme. The lorry routings for HS2 have been available since 2013 and are available on your own website as well as in many official publications. The conflict between the requirements of HS2 – modelled using the existing layout and capacity at Swiss Cottage – and the revised reduced capacity post-CS11 is clear and the implications are alarming. TfL did not take this into account in their original scheme modelling. The residents of Camden rely on you to insist that this situation does not continue and to require the publication of properly based modelling with a clear analysis of its results. You cover air quality in your letter. 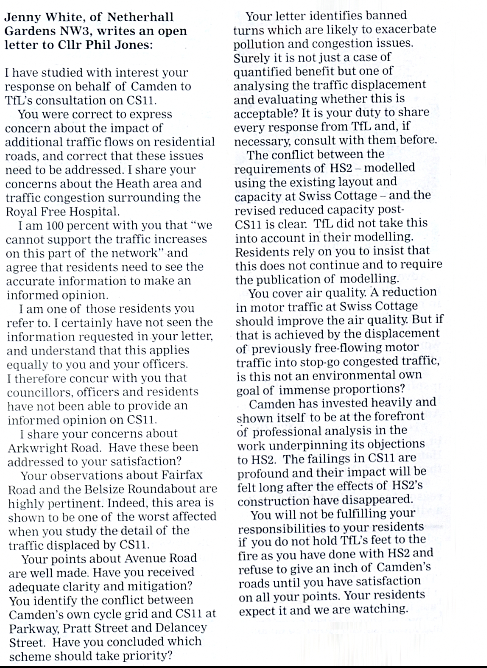 Logically, of course, a reduction in motor traffic at Swiss Cottage should improve the air quality at that site. But if that is achieved by the displacement of previously free-flowing motor traffic into stop-go congested traffic on minor borough roads, is this not an environmental own goal of immense proportions? I don’t believe that the conclusion of your response document is strong enough or in keeping with the fundamental flaws that your letter highlights. As a council, Camden has invested heavily and shown itself to be at the forefront of professional analysis in the work underpinning its objections to HS2. The failings in CS11 are profound and their impact will be felt long after the effects of HS2’s construction have disappeared from Camden’s streets. You will not be fulfilling your responsibilities to your residents if you do not hold TfL’s feet to the fire as you have done with HS2 and refuse to give an inch of Camden’s roads until you have satisfaction on all your points. Avenue Road from Adelaide Road to Norfolk Road is a Camden borough road and CS11 cannot be realised without it. You must not agree to contribute this stretch to the scheme until TfL have fully satisfied each of the reservations in the Council’s consultation response. You need to approach the unacceptable elements of the current CS11 scheme with the same admirable tenacity and transparency the Council has shown in its opposition to HS2. A hasty, private compromise with TfL behind closed doors will not do. This needs to be a decision publicly supported by verifiable evidence that your concerns have been satisfactorily addressed. Your residents expect it of you and we are watching. Do help us to raise the funds so that we are ready should TfL decide to recommend this scheme for approval and/or decide to implement it. If TfL scraps this scheme so that we do not need to issue proceedings, then funds will be returned to donors.